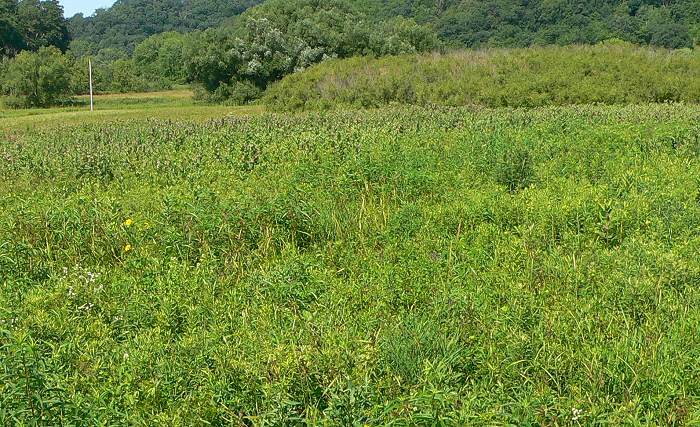 I worked more on Milkweed Meadow this week – the place in the wetland where we sprayed last year and it all came up in milkweed and other natives. 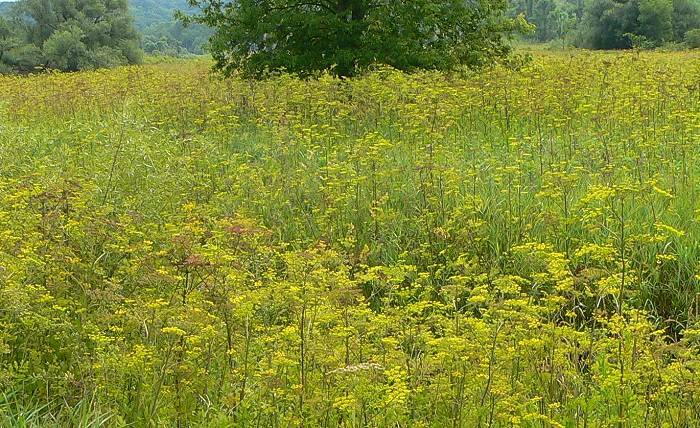 I finally got all the Wild Parsnip pulled – it looks much better. 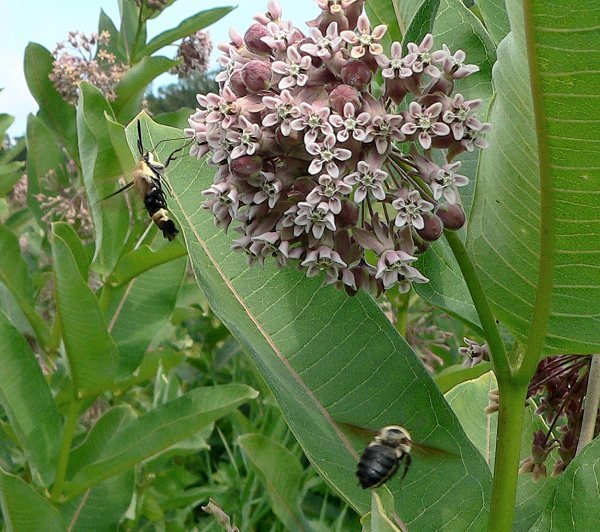 Milkweed Meadow without Wild Parsnip. The meadow is full of butterflies. 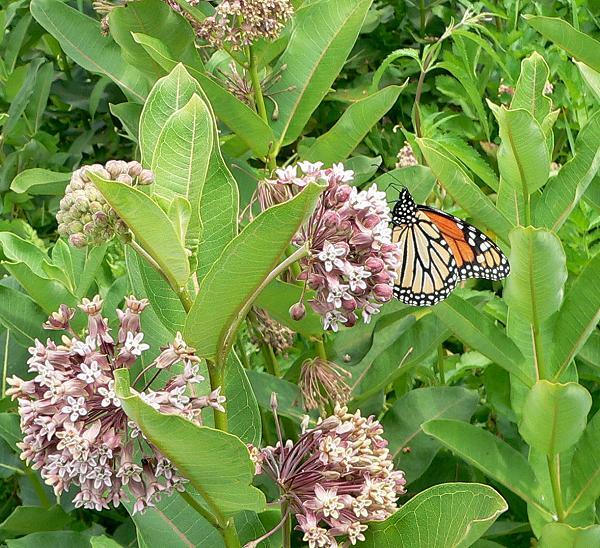 Milkweeds are the host plant for Monarch butterflies, and many kinds of butterflies and other insects use them as a nectar source. 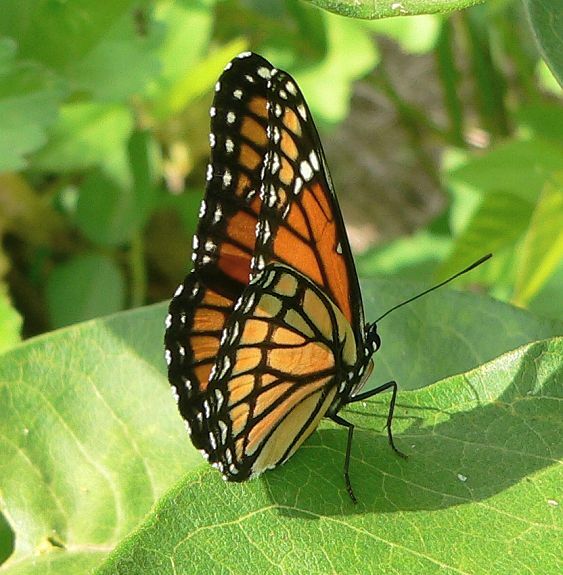 Viceroy – Viceroys are Monarch mimics. 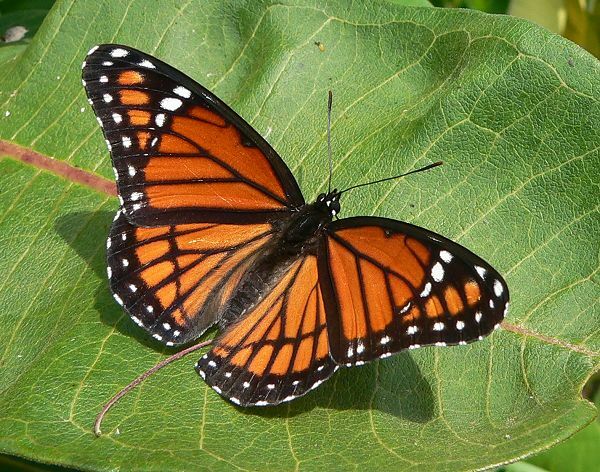 The easiest way to tell the difference is that Viceroys have a black line across the center of their back wings which Monarchs don’t have. Viceroy – underside of wings. 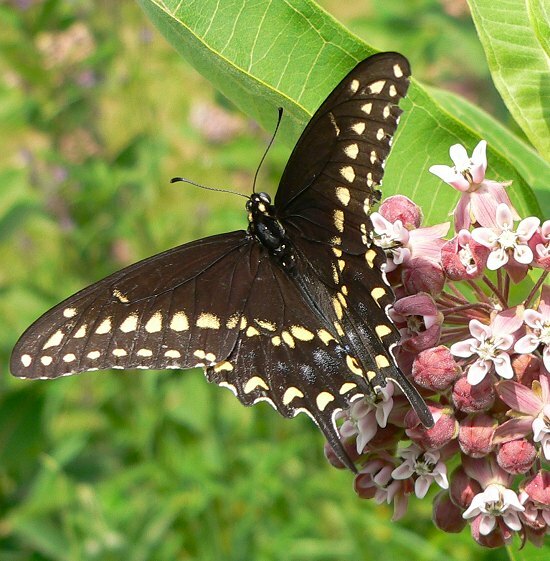 Black Swallowtail – this is a male. The females have more blue on top of the hind wings. 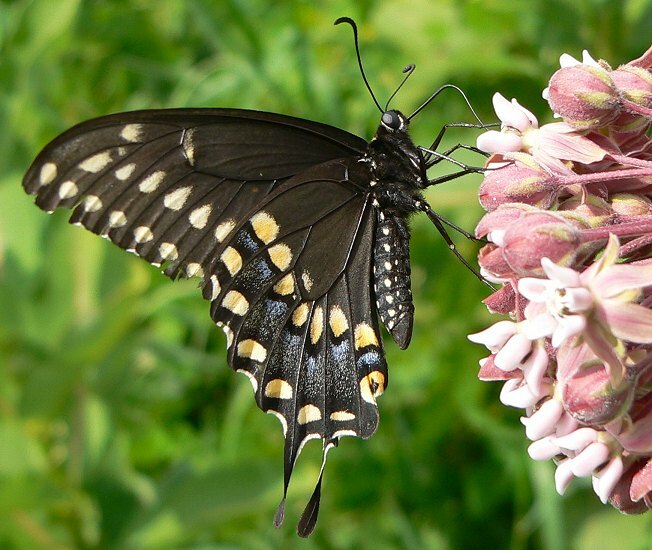 Black Swallowtail – underside of wings. 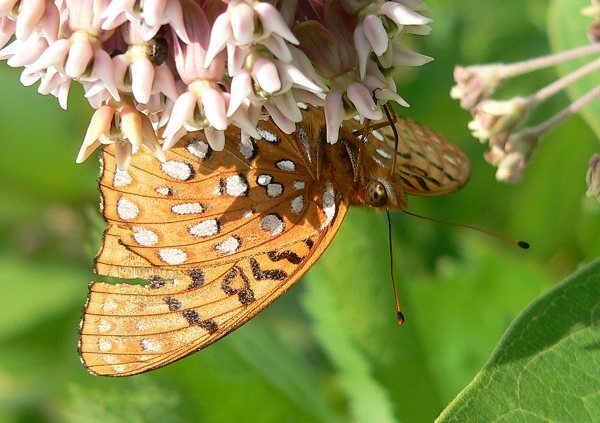 Fritillary – probably a Great Spangled Fritillary. 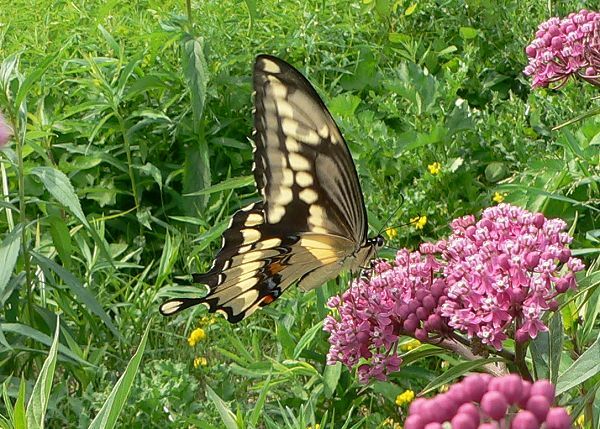 Giant Swallowtail on Swamp Milkweed. 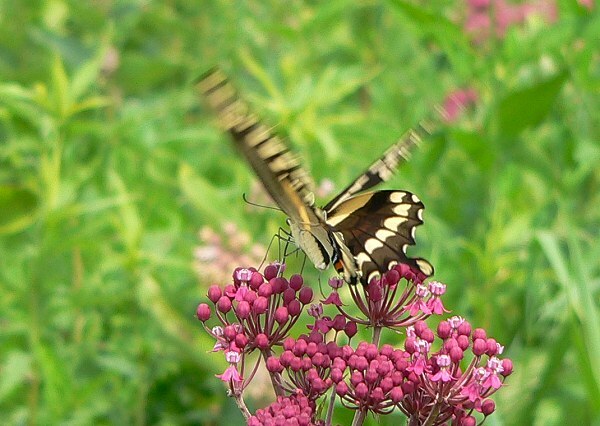 Swallowtails often hover, rather than landing on flowers, so their wings are constantly moving. There’s still a lot of parsnip left to cut. 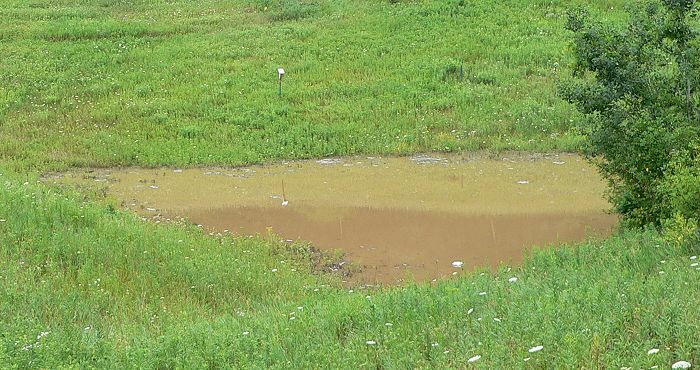 This is a part of the wetland that makes me feel very discouraged. This time of year I can change my method of parsnip cutting – I don’t need to pull the whole plant anymore. The seeds are starting to ripen and the stems are turning brown. Now I can clip the seeds off the plants and remove them, and I don’t have to worry about the stalk sprouting more flowers. Since Parsnips are biennial, they’ll die after they’ve finished flowering. 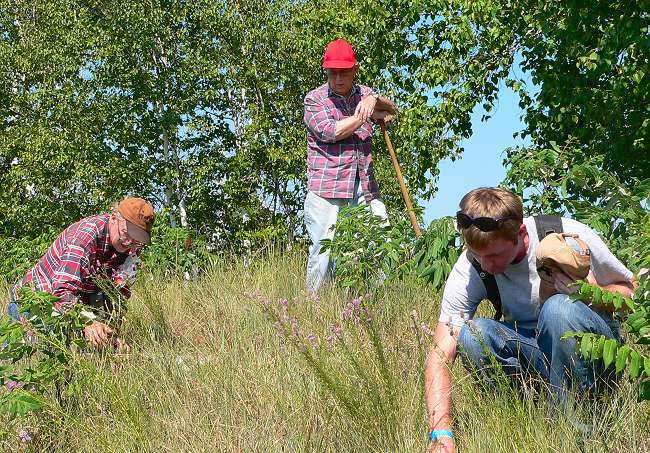 Some of my botanist friends came to visit this week – Emmet Judziewicz from UW Stevens Point and some the folks he works with. 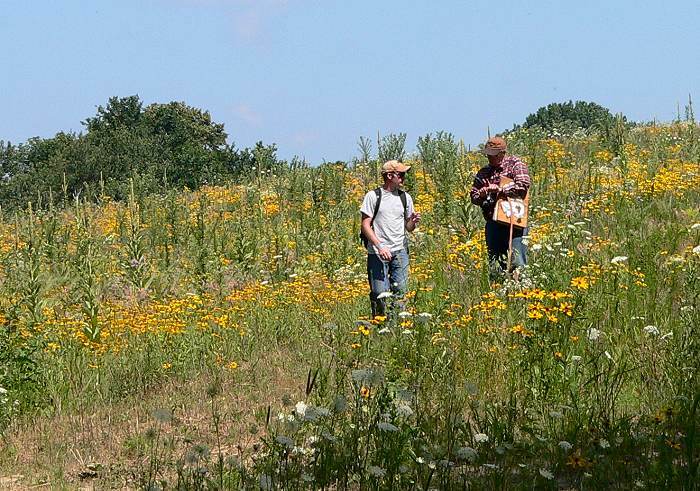 We walked to several of our remnants and across two of our planted prairies. 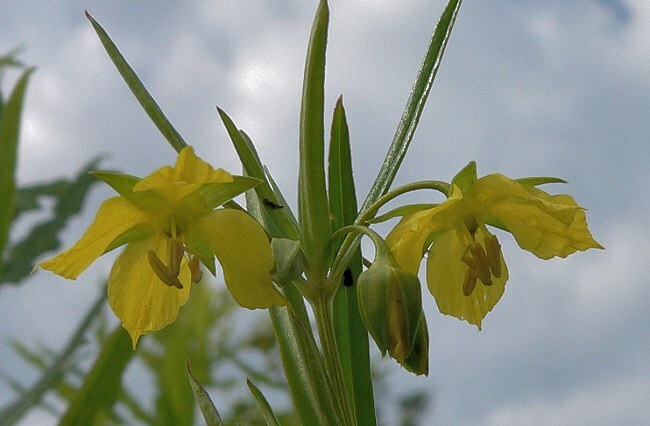 The planted prairies are full of flowers, but the remnants looked very dry. 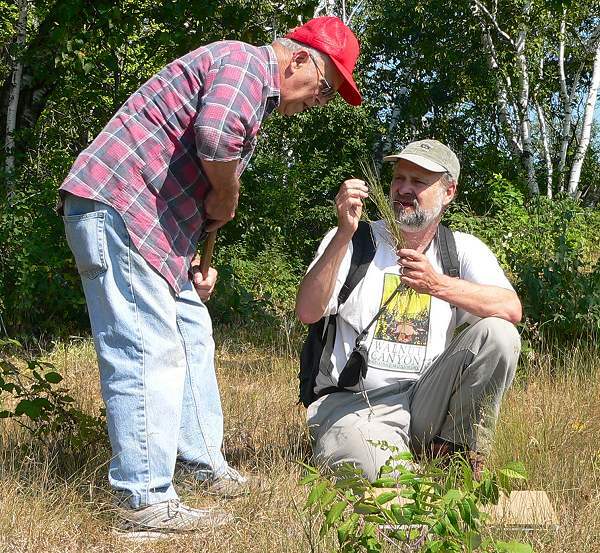 John and Alvin in Western Prairie. 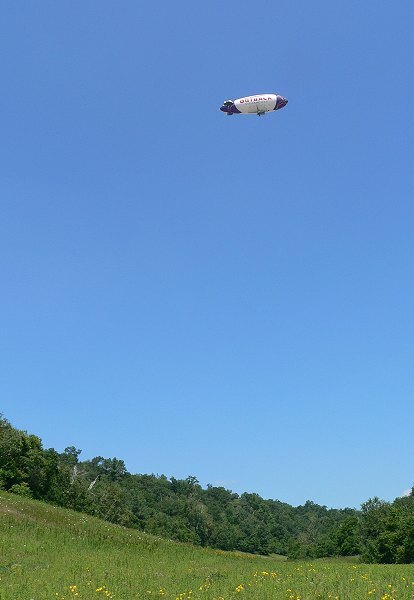 As we walked back to the house a small plane circled over Center Valley and then an advertising blimp appeared over the hill. The small plane kept circling around it and they headed east across the valley. The blimp looked like it was having trouble with the strong wind – pitching and rolling from side to side. Fortunately it made it over the next hill and disappeared. 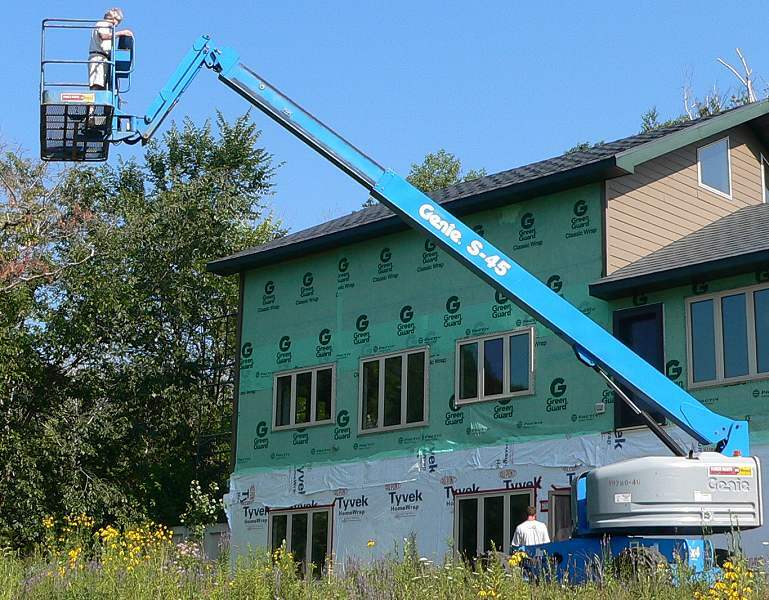 We’re having some work done on the outside of our house and Mike and the guys rented a lift to make it easier to get to the top of the house. 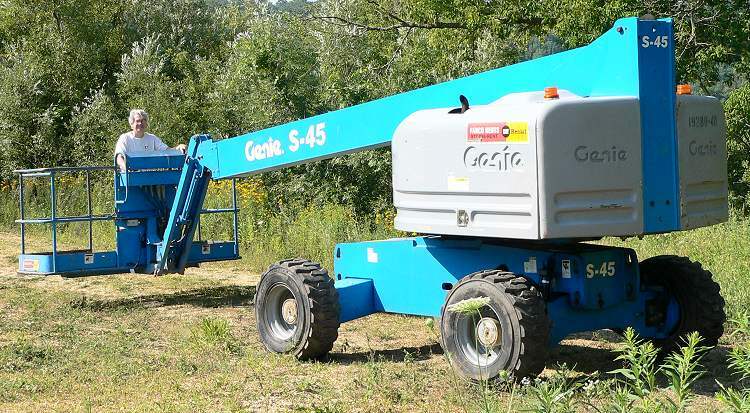 Mike was excited to be able to drive a new vehicle. Here he is driving it around. We decided to take out the liner we put in the Frog Pond – we didn’t put it in right, so it never held much water, and the animals poked holes in it, so it held even less water. We ripped and pulled most of the plastic out – a messy job! 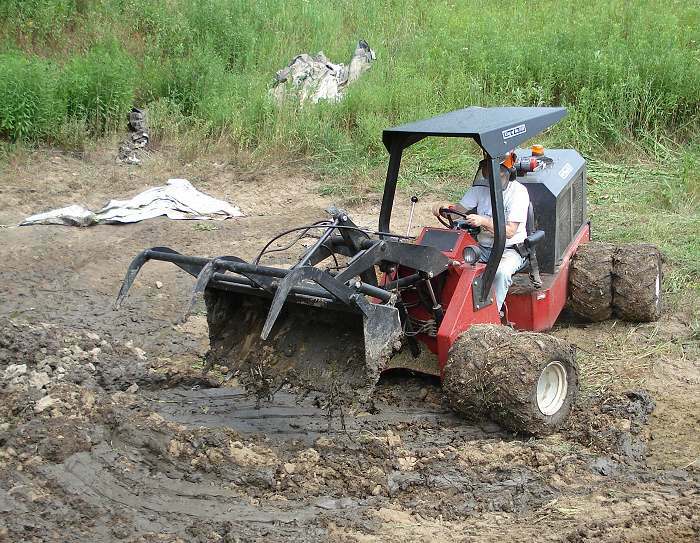 Mike used the powertrac to pull more out, but there’s still a muddy place in the middle that has mucky plastic in it. Pulling plastic out of the Frog Pond. Then, last night, we got the first real rain that we’ve had for several months – 4 ½ inches. The frogs started singing as soon as the rain started. They’re happy, and their pond is full, but we’ll have to wait a while to get the rest of the plastic out. Frog Pond after the rain. We heard a wolf again this week – howling from the top of Western Ridge, and then, a few minutes later, from the next valley to the west. 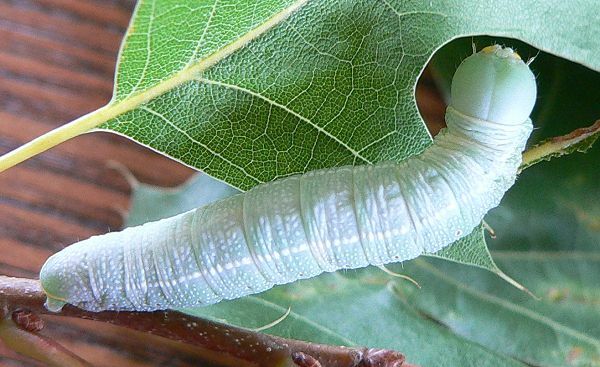 The Polyphemus caterpillars are now about 2 ½ inches long. 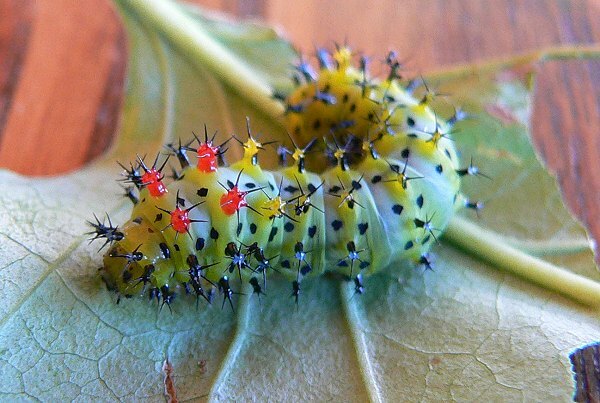 The cecropias are smaller – only about an inch long – but they’re starting to get some of their colorful knobs. 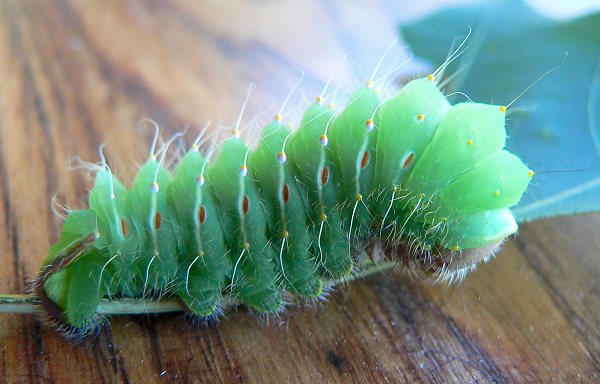 This is the Juvenal’s Skipper caterpillar. 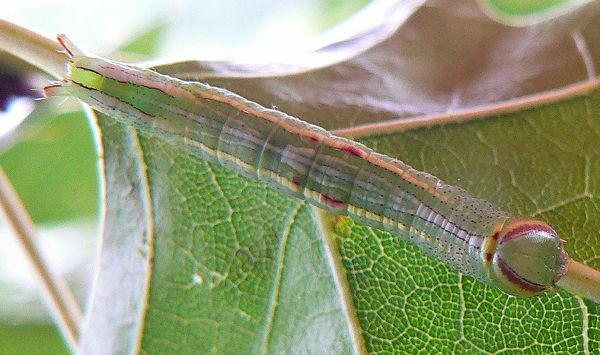 Here’s another oak-eating caterpillar that I found on the oak leaves I brought in for the Polyphemus caterpillars. I’m pretty sure it’s a Saddled Prominent (Heterocampa guttivitta).